Infrared investigations allow us to eliminate false or misleading assumptions, such as incorrectly attributing leaks to the flat roofing system when the water is actually entering the building through the exterior walls. If the source of water infiltration is identified incorrectly, the flat roof may be repaired and serviced pointlessly several times in an attempt to find the location of the leak. As the leaks continue, more interior finishes will be damaged, and the cost for repairs will escalate. In any case, the source or sources of moisture must be found and confirmed; otherwise, the conditions may return soon after the membrane is replaced. Subsurface moisture can lead to damaging mold, insect and animal entry, leaks, and ultimately lost productivity and damage to important company assets. The continued presence of moisture may eventually cause structural damage to the flat roof deck. At Roof Maintenance.ca we eliminate flat roof leaks with no guesswork involved. When scheduling an infrared scan, it is important to take into consideration the time of day we perform your scan and the expected weather in the days leading up to your scheduled infrared roof inspection. There are optimal conditions that incorporate the time of day and weather that allow us to get the most accurate readings and results. Most flat roof inspections are conducted by physical walk about of the roof by our IR Technicians who inspect surrounding roof surfaces. During spring, summer and fall months, this is done before unset and continues a few hours after sunset depending on the conditions and roof type. During fall, winter and early spring when temperatures drop below 10℃, IR inspections can also be conducted two to three hours prior to dawn (provided that they are not covered in snow). If you have been having repeated issues with your commercial flat roof, an infrared roof scan is the ideal solution because this shows that there is something being missed by the human eye. Countless times we have been called to a roof to repair an already repaired area which shows that other contractors are still guessing where the leak is coming from. With thermal imaging, there is no guessing. The damaged areas are repaired the first time. There are a few variations of an infrared scan so we support only the best and proven technology. 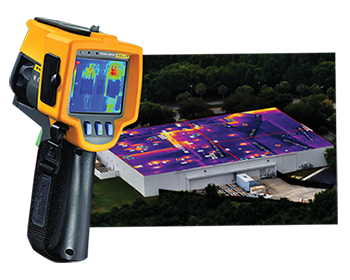 FLUKE imaging technology provides visual documentation and pictures which we can supply to you, so that you understand what is occurring on your roof. Traditional roof inspectors may have the experience close to Roof Maintenance.ca staff but they lack the specialization in technology and modern strategies. They will not know the exact places that require repair or recovery and will often recommend a full flat roof replacement to solve the issue. With Roof Maintenance.ca, the cost of investigating for flat roof leaks and subsurface moisture is justified when compared to the difference between the cost of a new flat roofing system and the cost of a new flat roof system plus structural repairs. For clear and honest advice on your roof situation, schedule an inspection completed by a Roof Maintenance.ca technician. You will be provided with supporting documentation on your commercial or industrial flat after the infrared scan is completed.